The fifth edition of this congress, organised by French institutions PVSI (Pôle de Valorisation des Sites Industriels) and INSTN (Institut national des sciences et techniques nucléaires), took place in December. Its objective was to give an overview of the challenges and prospects for the decommissioning sector, and to present the major projects that are underway in the world. 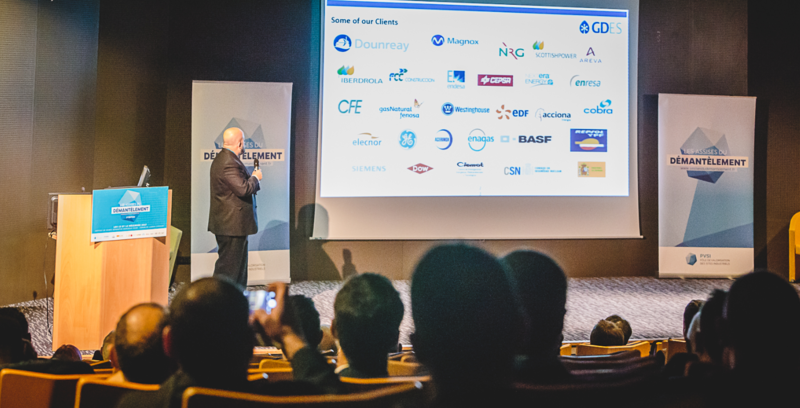 ‘LES ASSISES DU DÉMANTÈLEMENT’ was held at the Marcoule Nuclear Site (France), and brought together almost 300 participants and more than 120 companies. The event shone the spotlight on experiences and strategies implemented in Japan, Spain and the United Kingdom. José Tomas Ruiz Martínez, Chief Operating Officer at the Spanish company GD Energy Services (GDES), which specialises in high added-value services for the nuclear industry, spoke about decommissioning in Spain and GDES’ experience of more than 30 years in decommissioning projects, not only in Spain but also in other countries such as the United Kingdom and Italy. It represented an exceptional opportunity to showcase the Spanish decommissioning system, the leading role of ENRESA, and the considerable experience of GDES in decommissioning nuclear facilities. The attendees showed great interest in the projects developed in Spain, further boosting the profile of GDES as a key strategic partner in decommissioning projects in France and other European countries. The convention was also the perfect setting to exchange experiences and share ideas on the future of the global decommissioning industry with representatives from Japan and the United Kingdom, analysing the work carried out on Fukushima, the need to adapt to new technical and legal challenges, and the emergence of new robotic and digital technologies.